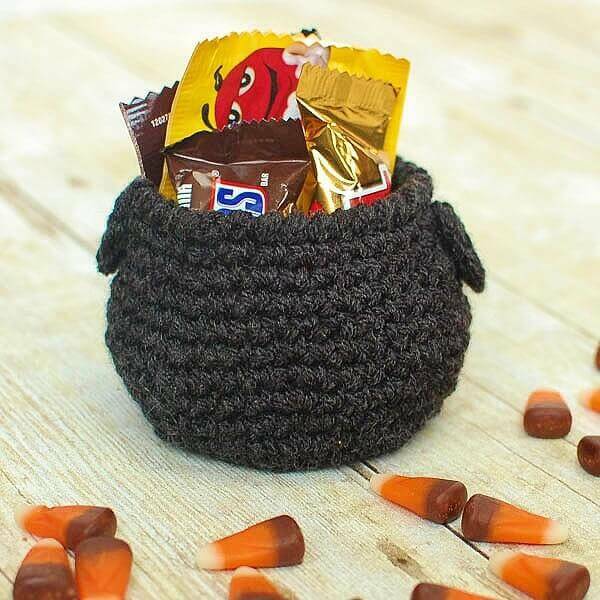 This little cauldron is such a fun Halloween crochet pattern to work up and to add to your Halloween decor! And it is the perfect size to add this treats for your sweeties too! Round 5: Ch 1, work 2 sc in same st as join, 1 sc in each of the next 3 sts, *2 sc in next st, 1 sc in each of the next 3 sts, rep from * around, join in BL of 1st st of round — 30 sts. Round 6: Ch 1, work 1 sc in the BL of same st as join and each st around, join — 30 sts. Round 7: Ch 1, working through both loop again, work 2 sc in same st as join, 1 sc in each of the next 4 sts,*2 sc in next st, 1 sc in each of the next 4 sts, rep from * around, join — 36 sts. Round 8: Ch 1, work 1 sc in same st as join and each st around, join — 36 sts. Round 9: Ch 1, work 2 sc in same st as join, 1 sc in each of the next 5 sts,*2 sc in next st, 1 sc in each of the next 5 sts, rep from * around, join — 42 sts. Rounds 10 and 11: Ch 1, work 1 sc in same st as join and each st around, join — 42 sts. Round 12: Ch 1, beginning in same st as join, *sc2tog, 1 sc in each of the next 5 sts, rep from * around, join — 36 sts. Round 13: Ch 1, work 1 sc in same st as join and each st around, join — 36 sts. Round 14: Ch 1, beginning in same st as join, *sc2tog, 1 sc in each of the next 4 sts, rep from * around, join — 30 sts. Round 15: Ch 1, work 1 sc in same st as join and each st around, join — 30 sts. Round 16: Ch 1, working back across round just made, work 1 rev sc in each st around, join — 30 sts. Ch 6, join with a Sl st in furthest ch from hook to form a ring. Round 1: Ch 1, work 10 sc into ring, join in first st made — 10 sts. Fasten off leaving a long tail to attach handles to side of cauldron. Using a tapestry needle and the long tails, sew the top of each handle to opposite sides of Round 15 of the cauldron. Weave in ends. Click here for more of my free Halloween patterns. The heat out there lately has made me yearn for cooler weather and put my thoughts to Halloween. I did an early Halloween round up and included a link to your pattern. Thank you so much for sharing your craft! I look forward to making one of these for myself this year. I’d love to make them as gifts too, but finding the time with three boys is just a little difficult. Hehe. This would be cute for St. Patrick’s Day too! What size of yarn did you use? Kara this is SO ADORABLE! I love it!